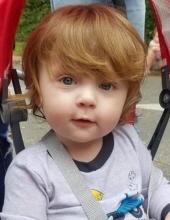 Joseph Brittan Cash Brock, 1 year old, passed away on March 30, 2019 in London, KY. He was born on April 21, 2017 to Vaughn Brock and Kelsey Kaitlyn Marie Jones. He is preceded in death by paternal grandfather: Vaughn Brock and special family: James Barger & Jessica Slover. He is also survived by maternal grandmother: Charlena Jones (Darrell Stacy); maternal grandfather: Jody Todd Jones; paternal grandmother: Angie Brock; great grandparents: Josephine Jones and Betty & Ronnie McIntosh; one sister: Haylee LaVonn Brock; one brother: Kolytn Blaize Le'Ashton Brock; special uncle/brother: Taven Jones and a host of family & friends. To send flowers or a remembrance gift to the family of Joseph Brittan Cash Brock, please visit our Tribute Store. "Email Address" would like to share the life celebration of Joseph Brittan Cash Brock. Click on the "link" to go to share a favorite memory or leave a condolence message for the family.